K&N – Mini Cooper Gets Moar Powah! The MINI Cooper is a smaller compact car designed by vehicle manufacturer BMW. The current BMW MINI Cooper was designed larger and faster than the previous models. The MINI Cooper and Cooper Clubman (Estate) bring style, comfort and performance directly to the forefront. 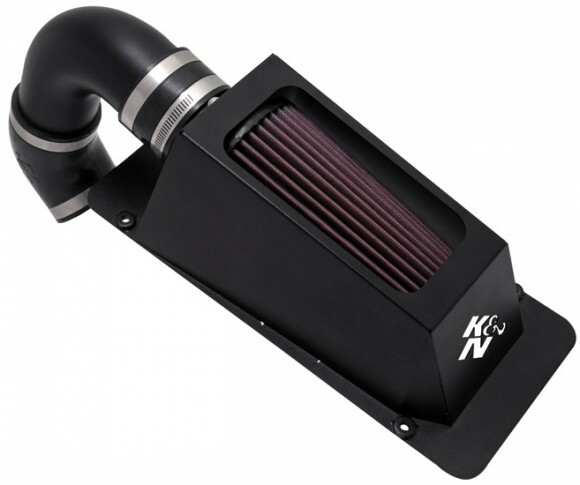 K&N designed a performance boosting air intake system (69-2005TTK) for the 2007 to 2009 MINI Cooper 1.6L and 2008 and 2009 MINI Cooper Clubman models with the 1.6L engine. The 69-2005TTK only fits U.S. models at this time. 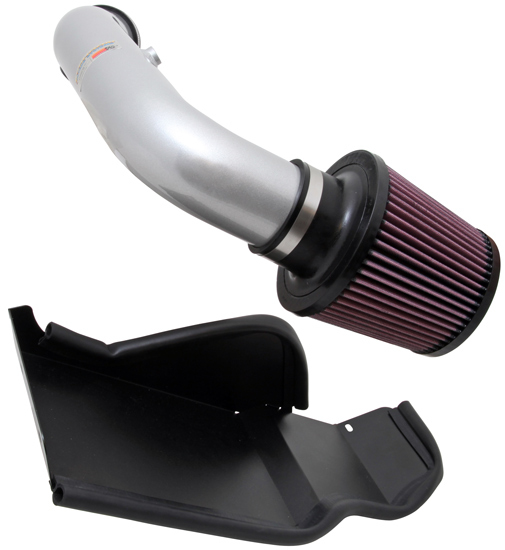 K&N air intake systems are guaranteed to increase horsepower and acceleration. Dyno testing revealed a 4.1 horsepower gain at 5300 rpm with this simple performance modification. The 69-2005TTK completely replaces the factory intake housing and air filter with a custom intake tube that straightens and smoothes airflow to your engine and a K&N cone air filter (RC-5144). The RC-5144 is a washable and reusable high-flow air filter designed to provide excellent filtration and performance. Complete installation instructions with photo illustrations are available on KNFilters.com. A typical 69-2005TTK installation takes less than 90 minutes and can be done with common hand tools. Check out the Mini Cooper install video for more information about installation of K&N’s performance intake system for the MINI Cooper and MINI Cooper Clubman. 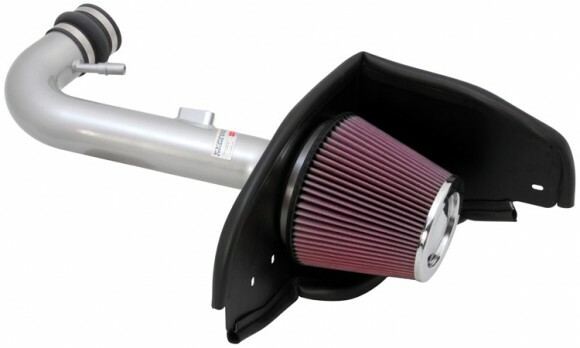 K&N’s power gaining 69-2005TTK air intake system is backed by the famous K&N Million Mile Limited Warranty. K&N – 2010 Mustang V6 Goes Faster With K&N! Ford Mustang owners are generally passionate about their car and its performance. 2010 Ford Mustang owners who have the 4.0L V6 can enhance their engine’s power with the installation of a K&N high-flow intake system. K&N offers a high performance air intake system that guarantees your 4.0L V6 Mustang will pick up extra power. K&N intake system 69-3525TS replaces your factory air filter and air intake housing with a custom intake tube and an oversized High-Flow Air Filter™ (RC-4381). This conical shaped chrome top air filter captures harmful particles, provides a large surface area and high air flow. RC-4381 can go up to 100,000 miles, depending on driving conditions, before it needs service. K&N part number 69-3525TS includes a silver powder coated mandrel-bent aluminum intake tube. Our powder coated aluminum intake tubes offer power and a stylish appearance. This kit also includes a black powder coated metal heat shield to help isolate cooler air from the warm air inside your Mustang’s engine bay. K&N dyno tested the 69-3525TS air intake on the 2010 Ford Mustang with a 4.0L V6 engine. Dyno tests show an increase of 5.16 horsepower at 4,700 rpm. A K&N intake system will provide your Mustang with outstanding engine protection and a power increase you can feel. In addition, K&N offers a Drycharger® filter wrap that can be used in conjunction with part number 69-3525TS. Drycharger® filter wraps are made from a durable polyester material containing uniform micron openings which will stop small dirt particles and repel water; yet add little restriction to the airflow of your filter. Available in a variety of colors, K&N Drycharger® filter wraps can be color coordinated with your car’s finish or your favorite race team. Installation of 69-3525TS can typically be done in 90 minutes or less using common hand tools. K&N provides detailed instructions that are designed to guide you through the installation process. This 2010 Ford Mustang air intake system is designed to last the life of your car. 69-3525TS comes with the K&N Million Mile Limited Warranty® and offers an easy bolt-on performance increase for your Ford Mustang. K&N – 2010 Kia Soul Gets New Breathing Aid! Is it a crossover? Is it a hatchback? Is it an economy car? Is it a utility sedan? YES! Kia Motors’ slogan, “The Power to Surprise” is personified in the Kia Soul. The Soul offers drivers an economy car capable of 30 MPG, 4 trim levels including an available Sport package with 18 inch wheels, an interior capable of accommodating both drivers and passengers with ample legroom, standard USB/iPod interface on all models, and bold distinctive body lines that set it apart from its competitors, all for an MSRP under $20,000. Now, Kia Soul owners can amplify their self-expression in their Soul with the addition of a K&N air intake system! K&N has released a high-flow intake system (part number 69-5306TS) to fit the 2010 Kia Soul with the 2.0L four cylinder engine. 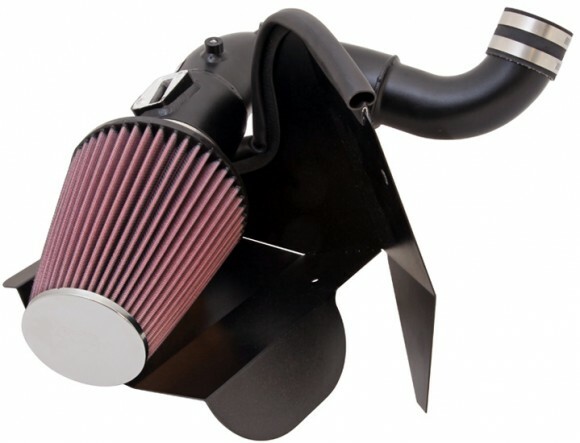 The K&N air intake replaces the Soul’s original air box, air filter, and air delivery tube with a free-flowing, low restriction system which includes an open-element washable K&N cotton air filter (part number RU-4990). By changing the restrictive original components to a high-flow, low restriction design, K&N engineers were able to unleash an additional 5.13 HP at 5300 RPM in the Kia Soul. This added performance comes as a result of a mandrel-bent aluminum tube, which K&N engineers designed specifically for the Soul’s engine compartment. The K&N tube has a powdercoated silver finish for an attention-grabbing appearance under the hood, and attached to the tube is a washable, reusable K&N air filter, which can go up to 100,000 miles before cleaning is necessary. This combination provides the Soul’s engine with ample air flow and excellent dust and dirt protection. In fact, the 69-5306TS system is backed by K&N’s Million Mile Limited Warranty. The K&N system is also very easy to install using simple hand tools, and includes step-by-step photo-illustrated instructions. K&N – 2008+ Chevy Cobalt SS Gets A Boost! The very impressive Chevrolet Cobalt SS is a front-wheel-drive compact car that is comfortable, economical and fun to drive. Chevy released their first 2.0 L Ecotec LNF turbocharged Cobalt SS in 2008 to replace the supercharged engine offered from 2005 to 2007. Tight handling, powerful brakes, excellent acceleration and a great sound system set the Chevy Cobalt SS 2.0L Turbo in a class of its own. Although the 260 horsepower turbo engine puts out an adequate amount of power, K&N wanted to increase that power with the introduction of their 69-4518TTK performance air intake kit. The 69-4518TTK is designed for 2008 and 2009 Chevy Cobalt SS 2.0L Turbo models and completely replaces the factory airbox and intake housing. K&N air intake system 69-4518TTK uses a mandrel-bent aluminum intake tube to lower airflow restriction attached to a high-flow K&N cotton air filter (RC-4470). 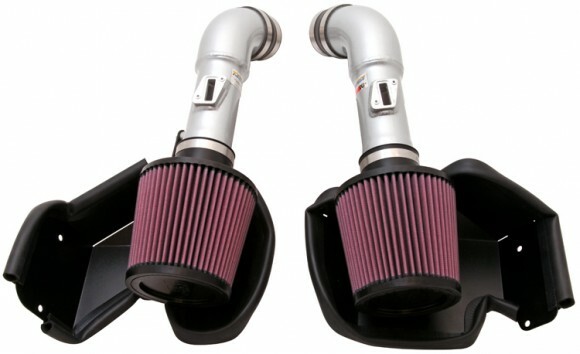 K&N air intake 69-4518TTK offers the Chevy Cobalt SS more horsepower and excellent filtration. K&N Dyno testing revealed a 12.2 horsepower boost at 4600 rpm with the use of this simple performance modification. Temperatures under the hood of a Chevy Cobalt can be very high because of the engine. K&N’s 69-4518TTK is equipped with a powder coated heat shield to help reduce the amount of hot engine air that enters the air filter. Installation of the 69-4518TTK performance air intake system is very simple with K&N’s installation instruction sheets. A typical install only takes 90 minutes and can be done with hand tools found in most households. Check out the Chevy Cobalt SS install video for more information about installation of K&N’s performance intake system or K&N’s Chevy Cobalt SS feature video for highlights and benefits of the 69-4518TTK air intake kit. The power gaining 69-4518TTK is backed by K&N’s Million Mile Limited Warranty. K&N – Infiniti G37 & Nissan 370Z Gets More Breathing Room! For years sports car enthusiasts have flocked to Nissan dealerships to get their hands on the infamous line of Z-cars. Since its introduction in 1969, the Nissan series of Z-cars has sold almost 2 million units and holds the record for best selling sports car series of all time. For many reasons the Z was forced into hiatus during the late 1990’s. When it resurfaced in late 2002 it wasn’t alone. Nissan Motors, who also builds luxury vehicles branded as Infiniti, created a line of Infiniti cars based on the Z platform. The now legendary G coupe and sedan were born out of this relationship. The 2009 and 2010 370Z and G37 are well-engineered machines. However, K&N engineers are constantly in pursuit of more power. After looking under the hood, K&N engineers knew that with their expertise these cars were capable of more. Much consideration was put into the design of part number 69-7078TS for the 2009-2010 Nissan 370Z and Infiniti G37 models with a 3.7L V6 engine. The stock intake tract uses a dual intake set up fed by dual air boxes and air filters. K&N intake 69-7078TS replaces the stock pieces with twin powder coated mandrel-bent aluminum intake tubes and dual K&N High-Flow Air Filters™ for improved air delivery. 69-7078TS incorporates two unique heat shields isolating the dual air filters from the warm air under the hood. This intake system provides improved performance and attractive silver powder coated aluminum Intake tubes to match the color of the engine bay. The result of this hard work and enthusiasm for performance is over 14 more horsepower at the wheels. K&N’s Research and Development Department tested a 2009 Nissan 370Z with a 3.7L V6 engine on our in-house dynamometer. Results showed horsepower increases throughout the RPM range with a shocking peak horsepower gain of 14.2 horsepower @ 5,600 RPM! Equally impressive is the extra 13.34 lb-ft of torque this car picked up at 5,600 RPM. This air intake system uses two conical shaped, High-Flow Air Filters. RU-4960XD captures harmful particles, flows more air, and provides long service life. This K&N air filter performs for up to 100,000 miles before service is required, depending on driving conditions. In addition, K&N offers a RX-4990DK Drycharger® filter wrap that can be used in conjunction with part number 69-7078TS. Drycharger® filter wraps are durable pre-filters that are designed to filter large dirt particles and thus extend the time before the main air filter needs to be cleaned. These wraps can also repel water but add little restriction to the airflow of your filter. The wraps specifically designed for this intake filter are available in black, blue, red, and yellow. 69-7078TS is a complete system which takes about 90 minutes or less to install with common hand tools. It uses stock mounting points, requires no drilling, and is covered by the K&N Million Mile Limited Warranty®. K&N Press Release – 2008+ Subaru Impreza STi Breathes Better! The Subaru Impreza WRX STi is known for its impressive performance, safety and comfort. It offers a wider rear track and an improved brake pedal feel. The new underbody also adds stability at higher speeds. Standard all-wheel drive, turbocharged engine, aluminum suspension, 18-inch alloy wheels and aggressively designed sport seats make the Subaru Impreza WRX STi a fun and attractive car to drive. K&N has developed an air intake system, part number 69-8005TWR for the 2008, 2009 and 2010 Subaru Impreza WRX STi with a 2.5 liter engine. K&N dynamometer testing shows an amazing 17.52 horsepower gain at 5260 rpm. The 69-8005TWR features an aluminum intake tube with a powder coated wrinkle red finish and a K&N carbon fiber top cone shaped universal air filter, part number RP-5113. The K&N washable and reusable air filter is isolated by a heat shield to help direct fresh outside air to the engine. The filter captures harmful particles, provides low restriction and also increases filter service life compared to the OEM air filter. It will perform for up to 100,000 miles before service is required depending on driving conditions. The impressive horsepower gain is also aided by the radius adaptor’s design as it smoothly takes the 5 inch flange of the air filter and connects it with the intake tube. The high-flow technology invented by K&N provides a great balance of airflow and filtration. 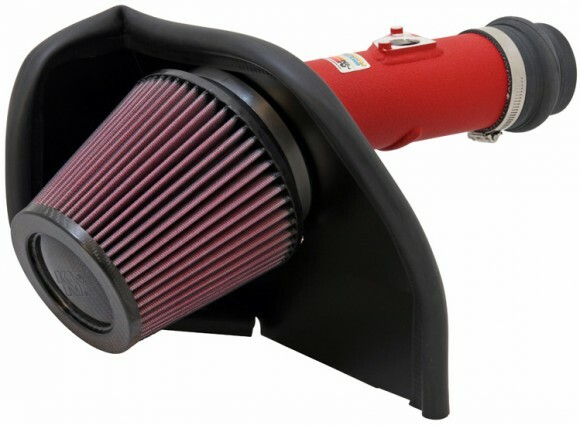 Designed to be installed with simple hand tools in 90 minutes or less, this K&N air intake system is backed by the K&N Million Mile Limited Warranty.